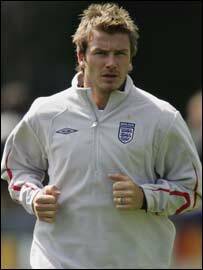 David Beckham believes England possess a perfect combination of silk and steel to make a massive World Cup impact. England's campaign starts against South Americans Paraguay on Saturday. And Beckham said: "I think the physical side always scares South American teams and teams in Europe we come up against, but technically we're up there as well. "The combination of the two scares people and scares teams and hopefully if we play to our abilities in this World Cup we can go far." And Beckham added that the speed of the Premiership gives Sven-Goran Eriksson's side another string to their bow. He said: "The Premier League is the highest tempo football you can come across, so that is also a good factor for us." On a personal level, Beckham believes he is in good shape to make up for the disappointment of his sending off against Argentina in France 98 and his injury-troubled time in Japan four years ago. He said: "I feel I have got better as a player in the fact that technically I'm lucky. I'm good at that part of my game but I think it has gone up a level since I've been in Spain. "It has had to go up a level because technically the game is different in Spain and you have to be technically more gifted playing for Real Madrid. "I'd like to think this could be my best-ever World Cup, but you can never tell what is going to happen in football. "The most important thing is I am fit, the rest of the players are fit and we are looking forward to this tournament. "I would give up everything on the personal side to win a trophy for the team, but you always want to perform well and play well and score goals and set up goals. "If I can do that, that's what I hope for."